Imagine a prefab home that looks perfectly at home in a small Italian village full of gorgeous character-filled old buildings. Then imagine that it's green-friendly, cheap to run and takes just five months to construct. It's hardly believable, right? Well, today you're in for a treat because we're travelling to a small Italian village called Centallo in Piedmont, where we'll find one such home. The home may have a traditional appearance, but the Italian builders Bar & Bar have designed it to take advantage of rapid construction techniques. It has a wooden structure and walls made with a gypsum fiber sandwiched with rock wool in the middle. Aesthetically, gypsum fiber is similar to plaster. But it has much, much greater structural strength. As with all prefabricated homes, these elements are constructed off-site, so the actual installation time is minimal. We should add that the estimated construction time of five months does not count the time needed to set the foundation concrete. So let's get on with a photo tour so we can explore this project in more detail! In our first glimpse, we see the home has an essentially rustic feel, but that the designers have also given it a sense of modern ease. The kitchen here has been designed with pared-back cabinetry and a subdued monochrome palette. It oozes just the right combination of simplicity and modernism. 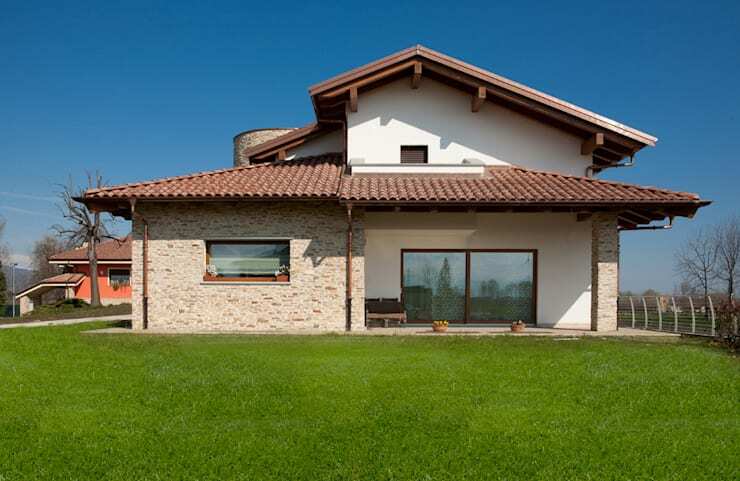 The home is set in a traditional Italian village and has several characteristics normally seen in this area. Stone bricks on the facade exude the old-world charm of Europe and red ceramic tiles complete the look. Note how the large windows and doors are a modern departure from the traditional style. They allow lots of light to penetrate the interior and open up the possibilities for a bright and sunlit modern interior. The house consists of a basement and two levels above the ground. The basement is made with reinforced concrete and houses a wine cellar (of course!) a garage and a laundry area. 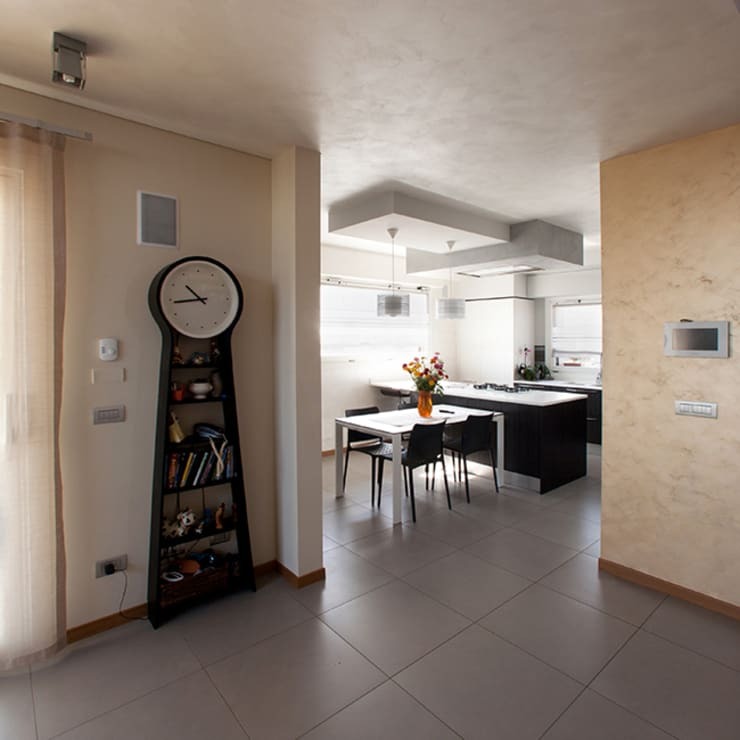 The total area of the home is a generous 240sqm. The ground floor we see here has been opened up to create a double-volume living area. This floor covers 180sqm and also contains a dining room, kitchen, two bedrooms, one dressing room and a bathroom. All that vast open space might cause concern for heating and cooling bills. But no fear! 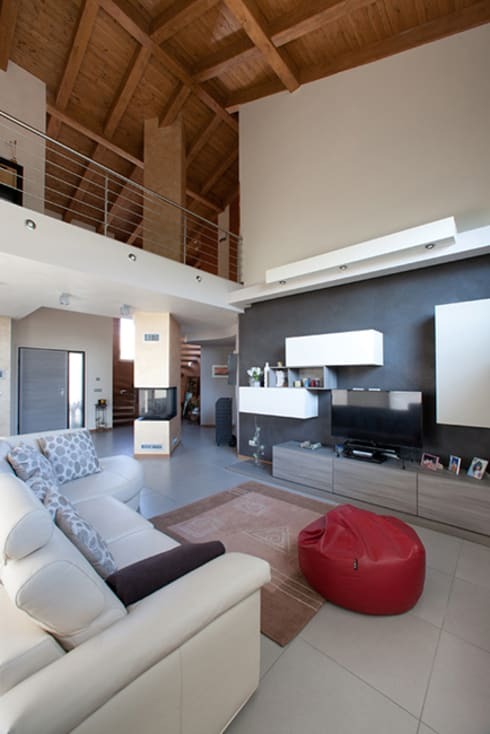 The house is equipped with central heating and climate control that can be operated remotely using a tablet or a smartphone. 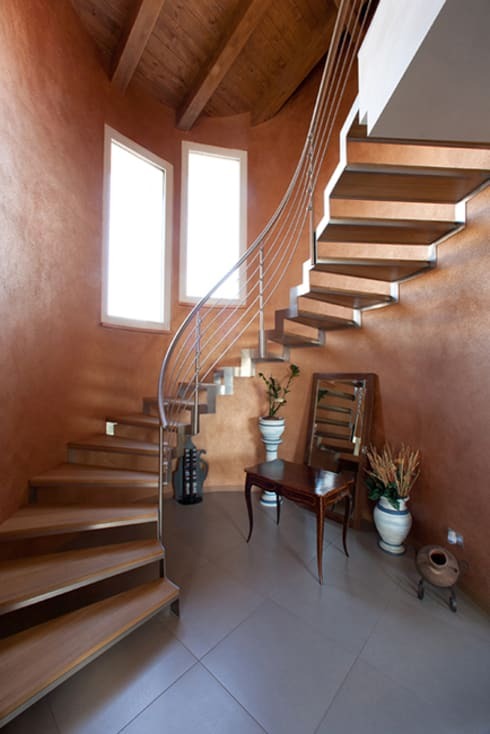 This is certainly a staircase design you don't see too often in prefab homes. The house is also designed to form one continuous capsule with good insulation. The walls are also designed with glazing that has low emissions. This can truly be considered a green building. The mezzanine covers an area of 60sqm and contains a large loft and another private area with a bedroom, bathroom and home office. 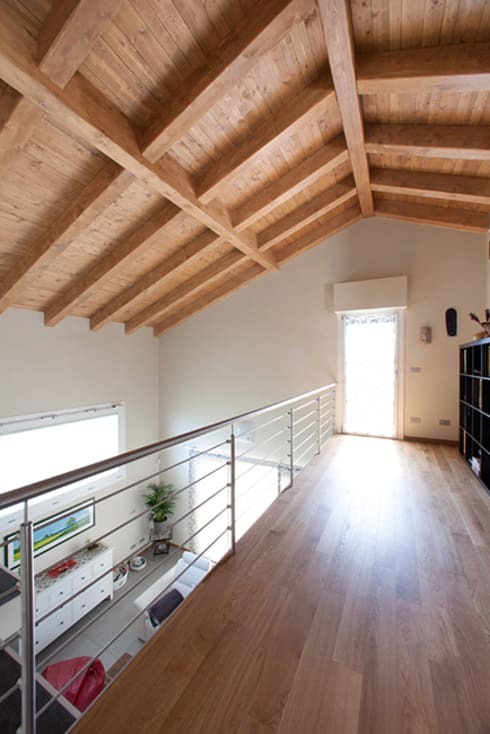 The exposed wooden beams on the ceiling are chunky at 22cm in depth. This gives the home a good, solid feel. The floor has also been laid with parquet oiled oakwood. For more home inspiration, have a look at 10 picture-perfect family homes you'll love. Are you a fan of traditional rustic-style homes?